The aim of a paper mill (papermaking) is to produce paper rolls. 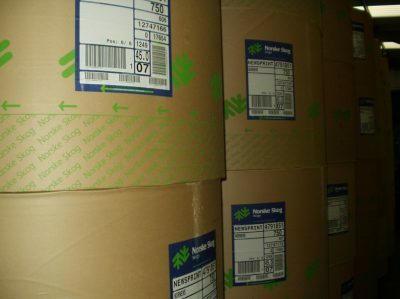 In the area of packaging, for example, these rolls are then sold to corrugators or solid board converters. Paper is a material made of vegetable fibers (cellulose); these fibers, reduced to thin particles and suspended in water, make up a pulp that is spread on a sieve and dried to thin sheet. Some paper mills still produce pulp from wooden logs or shavings; but today, in France, most of the paper mills transform waste paper bales (recycle paper). Kraftliner: a paper used for liners, mainly made of new fibres. It’s the most resistant and the most expensive. Testliner: a paper used for liners, mainly made of recycled fibres. Chemi-mechanical: the most resistant fluting paper. Wellenstoff: a fluting paper, mainly made of recycled fibres. A good stock management by batch and location is an essential management component for the business of a paper mill. The logistics, allowing for better delivery rounds, is also a key factor. Volume Software’s answer to the paper mills’ needs: VoluPack ERP. VoluPack information system is specifically targeted at paper mills.